Continuous improvement is an ongoing effort by a team to optimize their performance. The key to successful continuous improvement is a solution that can not only provide incremental improvement as the team works, but also one that can facilitate break through improvement through automation and reuse of best practices. Allowing everyone to participate with easily adopted best practices at your fingertips. All team members can contribute to incremental improvement through the use of easy to customize plans, dashboards, queries and work item templates. Planning is an act of continuously steering the team. Plans are easy to customized and can be repeatedly tweaked as the project evolves. Once in edit mode, changes can be made to the Display, Sorting, Filtering and Colors. Or click on the Columns tab to modify the columns that appear on the plan. 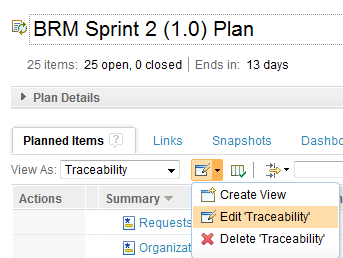 Below is an image of the plan editor, adding color code to identify gaps on the traceability view on a plan. Dashboards are also used to steer a team. Team members can also create personal dashboards to manage their own work. A full catalog of widgets is provided. Widgets can be moved around the dashboards by dragging and dropping. Multiple tabs can be added to organize widgets. You can customize the number of columns for each dashboard tab. Below is an image of a tester adding a Build widget to their personal dashboard. This allows the tester to keep track of the development team builds. Team members with the proper permissions can customize work items to meet the needs of the team. Below is an image of plan item that was customized by the CLM team. 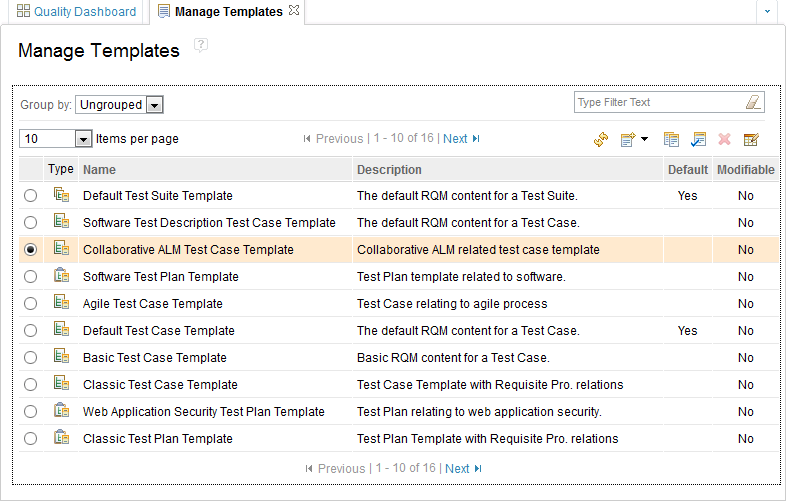 Notice the work item type is called “Plan item” and there are multiple tabs, each with a set of attributes. See the Work items feature for more information. Work item templates can be used to reduce manual work for commonly used patterns of work items. A template is a blueprint for work items that can be used to populate them with preset attributes and links.For example, a plan item such as an Agile “story” or a traditional “Feature” might always be broken into tasks for the analysts, developers, and testers. Simply build an prototype plan item with its related tasks, linked as “Children” and turn it into a template. Every time you need this structure, create a work item from the template. 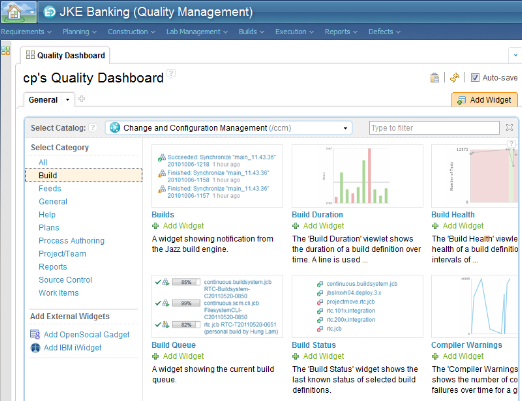 The quality management application provides templates for test plans, test cases and test suites. Use the provided templates or create your own to capture and encourage organizational best practices. Lifecycle project templates create breakthrough improvement by enabling administrators or project managers to use the provided lifecycle project templates, or create their own, to quickly onboard new teams. See the blog posted by Kai-Uwe Maetzel regarding Lifecycle Project administration.